YOUR SOURCE FOR PROFESSIONAL TAX SOFTWARE! 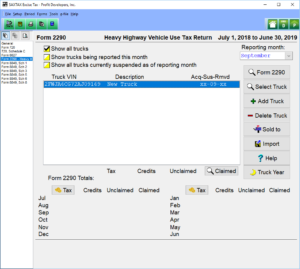 Our 2290 Program (Heavy Highway Vehicle Use) features easy data entry and an import for your trucks to make completing the return quick and accurate. Every filer will have to file a July return and as adjustments are made during the year, monthly interim returns can also be filed, to pay additional taxes. (Note: any credits from removed vehicles or supension will be netted against taxes before filing.) 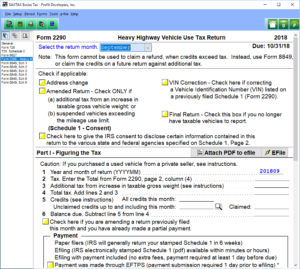 Once the return is complete, you can efile the return and receive your watermarked Schedule 1 from the IRS (which is required by the DMV to renew the trucks tag). If you have an abundance of credits that accumulate during the year, you can also file Form 8849 (also included with the 2290) to request a refund for any 2290 credits you cannot claim with Form 2290. Download a Demo or Order the 2290 Program now.